You are here: Home → Blog → FAQ Series: Can I share my survey data with others? FAQ Series: Can I share my survey data with others? Give clients, colleagues, and key stakeholders 24/7 access to real-time and personalized survey results. 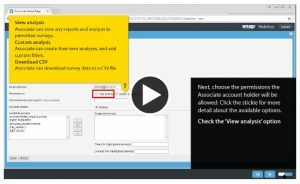 You can set-up individual accounts and set permissions to view specific analysis and reports, and easily create new analysis on-the-fly.